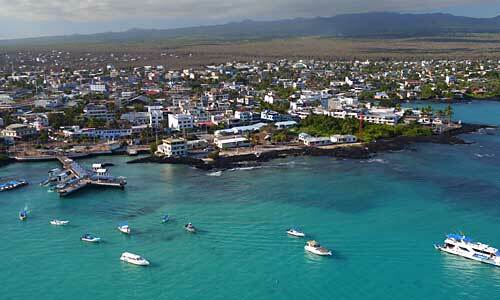 Isabela is the largest of the Galapagos Islands and consists of six volcanoes, five of which are still active. 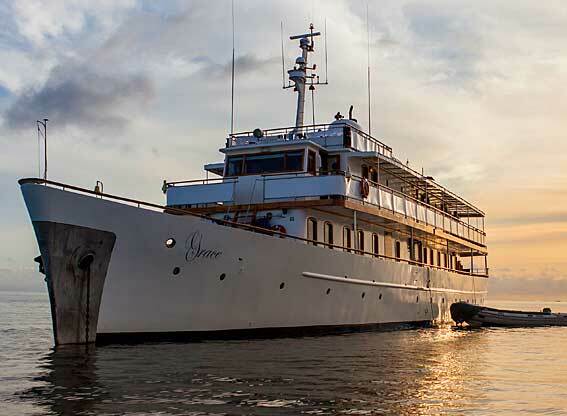 It is home to large numbers of wild tortoises and the water off the west coast is the best place in the Galapagos to view whales. 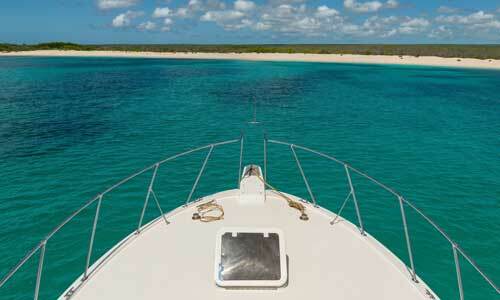 There are many visitor sites on Isabela, reflecting the size of the island it features on many boat itineraries. 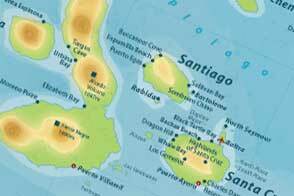 Four of these sites can be reached from the main town, Puerto Villamil. You can walk to Villamil lagoon, one of the best places to see migratory birds and, a little further on you can view hatchlings and older breeding tortoises at the Tortoise Centre. The Wall of Tears is about a 6km walk from the port. A visit here is a sobering experience. Prisoners of the penal colony that existed from 1944 to 1959 were kept busy building a wall, which served no other purpose. It stands to this day, a chilling testament to their futile efforts and man’s treatment of his fellow man. The fourth site you can reach from Villamil is Tintoreras. You’ll have to set sail in dinghy to reach this group of islets and you should see rays, turtles, marine iguanas and sea lions. 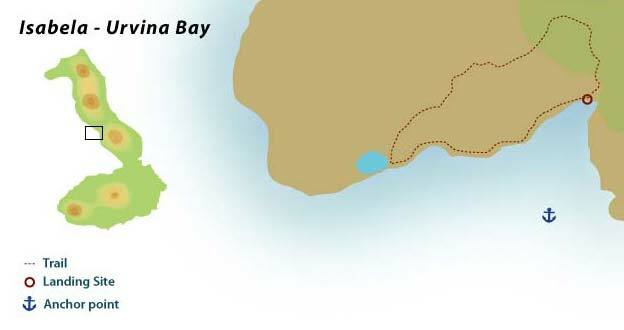 Urbina Bay (wet landing) is located at the base of Alcedo volcano. Having landed here you can walk along the beach past areas of lava. You’ll reach a wall of coral, visible following an eruption in 1954 and now standing 6kms inland. As you walk you can hope to observe flightless cormorants, giant tortoises and land iguanas. Tagus Cove (dry landing) is sheltered by two volcanic craters and has been used as a mooring place for over three hundred years. The cove is known for the inscriptions left by pirates on the cliffs, dating back to the early 19th century, which make interesting reading. It’s also the start of a hike to a viewpoint. 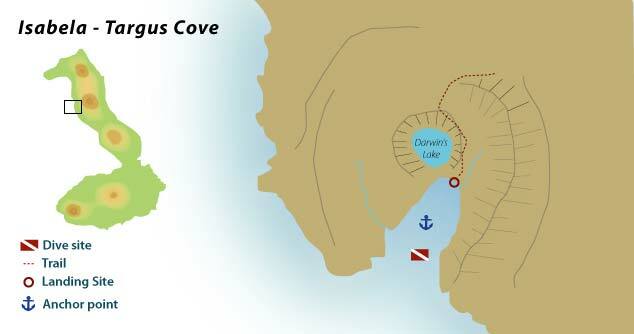 On the way you’ll pass Darwin Lake, a deep salt water lake and a good spot to see birds. The viewpoint is stunning and well worth the effort. You can also take a boat ride along the coast watching seabirds on the cliffs and exploring caves. Elizabeth Bay on the west coast can only be visited by boat and while you can swim and snorkel you’re not allowed to set foot on land. Look out for turtles, rays, flightless cormorants, penguins and pelicans to name a few. The Mariela islets near the bay are often included in a visit to Elizabeth Bay and have a plentiful penguin population. Moreno Point, near Elizabeth Bay, is the site of tidal pools and mangroves which attract sea birds including flamingos. Sierra Negra is one of the most striking volcanoes in the Galapagos and, arguably, the second largest caldera in the world. It is best seen from Volcan Chico, a small cone on the side of the volcano that erupted in 1979. You’ll be able to walk on relatively new lava flows and will get great views of the other volcanoes on Isabela. Punta Vicente Roca is in the north. It’s a small promontory with coves on either side of a volcanic ash cone. This is a good place to view nesting birds such as blue-footed boobies, Nazca boobies, gulls and terns by the shore. 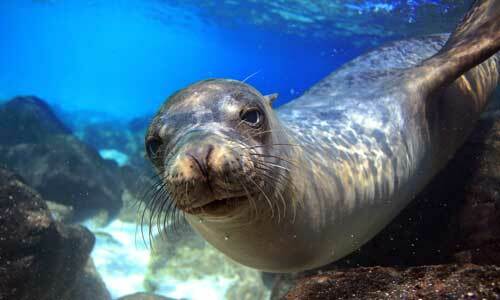 The waters teem with marine life including dolphins, whales and sea lions. There is also a small colony of fur seals here. Albemarle Point was used as radar base by the Americans in the Second World War and you can see the ruins of the base today. You may also spot marine iguanas here. There are several diving sites around the island where you should see profuse marine life including sharks, eels, sea lions, turtles and rays.